Character » Thor appears in 7120 issues. My blog on Thor vs Hulk, who should win? Answer for why didn't he do this to Spider-Man? Because of story plot. Hulk would mess up the story and kill Spider-Man along with the entire east coast and wrecking Marvel continueity. With the loss of the east coast means the loss of the White house, Avengers Manor, X-Mansion, Stark Tower, Stranges home, alot more weaker heroes/villains, and civilians. You simply cannot have Hulk just go all out on Spider-Man in a fight and not expect conseqences. Same logic can be applied to Thor. THIS is why character's such as Hulk and Thor have always been held back when written. You can't have them destroying comic continuity now can we? Thor himself, has constantly and consistently been weighed down by pis so he cannot wreck the entire planet with his power. Proof? He holds back against virtually every being he's fought against. I want to note that according to an interview with the writer Kevin Grevioux, when asked about that issue; He stated that the sequence was written to be a flashback discussing a battle with "Green" Hulk. The artist was instructed to show Thor in his Classic costume, but he made a mistake that wasn't caught until after print. 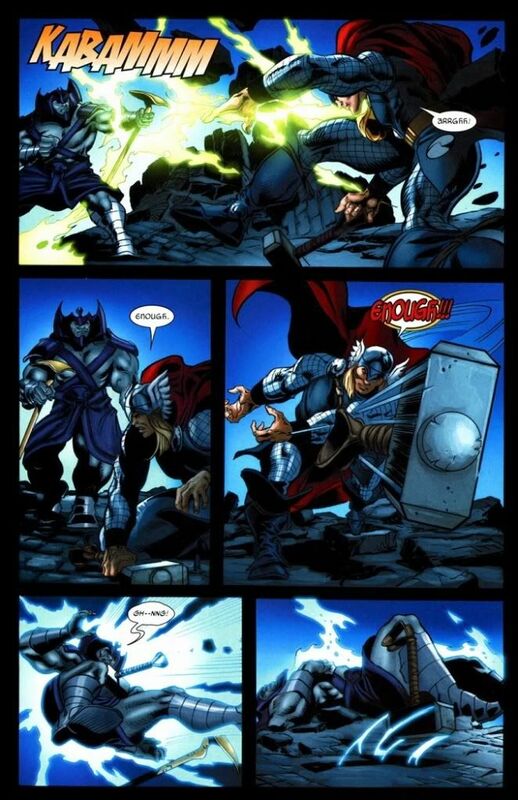 The artist accidently drew Thor in his current armor which gave the appearance that it was a current battle with Rhulk. ^ This proves that from these writers opinions, that if Thor decides to strike the Hulk at full power with an unrestrained blow with Mjolnir, he could kill the Hulk. He summons winds from 1000 worlds. Imagine every possible hurricane and tornado appearing everywhere on Earth. Now imagine that on 999 other Earths and imagine it together into one attack. This attack is easily on level of multiple planet busting and the fact that it had injured Glory (A skyfather that was stated by the writer to have power equal to a pissed off Odin) proves that this attack is no joke. This attack logically should tear apart even current Hulk itself. Imagine if he used this attack against the Dark Avengers or Hulk in EVERY fight. Would he logically lose then? Here, Bill states he has crushed moons before with his fists. Could this be a hyperbole? No. If you noticed the situation he was in and how his character and personality is, he isn't the type to lie and utilize perfidy. Also, add in the fact that he has shattered planetoids before. Here, Bill states in a possibly deadly tone, that he has shattered planets before with his hammer and then, proceeded to strike his enemy with an unrestrained hit. Thor has portrayed and demostrated feats that suggests he's capable of preforming the exact same feats that Bill has shown. After all, the hammers possess the same amount of power and the beings wielding the hammers are physically equal. "Now enough of Bill, what about Thor?" Now that we established that Thor does possess the ability to control his hammer with his thoughts, we can get back to the black hole scan. We see that Thor flew in a manner that appeared to be shaped like a U, not a straight line. This insinuates that Thor MUST'VE controlled his hammer within that exact scan. Now we know that Rulk was flying at speeds faster than light, we know that Thor can control his hammer with his thoughts, what else is left? Oh yes, in order for Thor to change the direction of where he was flying to catch Rulk from being sucked into a black hole, Thor MUST possess the reaction speed liaison to the speed of light. Thor's equal Bill, possesses nanosecond reaction speed as well. Characters on the level of Thor and Bill usually possess the ability to react to light. It's not hard to believe. "You have to be moving faster than light to escape a black hole, but that doesn't mean that Rulk was moving at light speed, I'm not sure where that claim comes from...As far as I can tell he has not even in the event horizon yet (the "point of no return where one would need FTL speed to come out). This undermines the whole argument.... Anyway's flying to catch and object hurtling in single direction is not the strongest example of reflexes OR reaction time. As the future position of the object can be judged ahead of time." The watcher describes the black hole as a simple "conventional" black hole a, Schwarzschild black hole. Outside of the event horizon, the gravitation pull of these black holes actually functions the same as any other object of the same mass. These black holes of this type can exist for any mass. So it would be impossible to determine the acceleration being applied to Rulk. Only that he was unable to hold onto that asteroid or whatever (not that I know why it would do him any good to hold onto it. "Why does Thor get hit by the Hulk and much slower people then?" In this fight, Thor states that he must move with blinding speed in the 3rd scan. The minimum I'd estimate for a man size object to move at blinding speeds is 1000 mph. However it's purely speculative and open up for arguments. In the last scan, Thor couldn't react to Hulk due to various factors which suggests that Thor's body cannot move that fast without his hammer. Thor clearly can react as shown in the entire fight, even in the last scan as he was thinking. 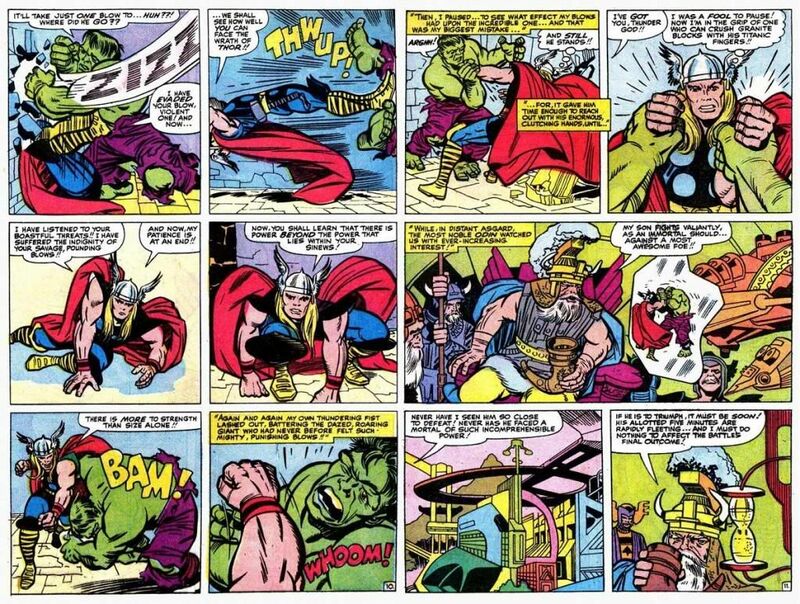 In fact, I want to use an example from that fight of Thor vs Hulk. Thor created an infinity vortex within that fight that even the mighty Hulk cannot get by. Thor's infinity vortex has portrayed many feats such as teleportation, negating Juggernaut's magic, forcefield, and invulnerability, and stopped a bomb that was capable of destroying 1/5th of the universe. Even World breaker Hulk cannot hope to touch Thor when he decides to protect himself within it's magical whirlwind. Thor threw Mjolnir into the farthest reaches of the galaxy and it returned to him around 60 seconds time. Thor's hammer was inactive for a period of time within that fight against Hulk in Journey to the Mystery. However one weakness of Thor is that he's always written to fight on par with his enemies in comics due to his sheer power over them. He's stated to have even held back against Gladiator, the superman of Marvel in terms of power. The reason for this goes both ways, for Thor and for Marvel writers. Thor holds back because of his arrogance and feeling of superiority over mortals. He also likes to test his strength and powers against others to prove he's superior. For the other explanation, the Hulk possesses a huge fan base, Thor's too powerful, and thus, Marvel writers weaken Thor to Hulk's level. Lets compare powersets, in the contest of strength, who would win? Answer is, Hulk. Yes, Thor's stronger than Hulk overall but however, Hulk's only power really is his strength whereas Thor has MUCH more to rely on rather than just his physical prowess. Thor in the beginning will be stronger but eventually and quickly, Hulk will reach his level and possibly bypass it. Both characters are written and done plotful things due to their strength. It's just Hulk will win eventually in a contest of strength due to his power. In terms of durability, Thor is more durable than Hulk. However, Hulk isn't far behind in durablity. He has incredible tolerance to blunt force. It's just that Thor has fought skyfathers on a regular basis and he has taken their attacks before with moderate damage whereas Hulk, has nearly died to Zeus in a physical brawl. Current Hulk nonetheless whom is more powerful than Savage Hulk. Strength: Hulk if he gets the chance to become angry enough. Otherwise, Thor. Durability: Thor towards energy based attacks and attacks of any other nature, Hulk towards blunt force. Speed: Thor due to Mjolnir. Versatility: Thor by a very far margin and not just because of Mjolnir. Hulk literally only has physical strength. Energy Projection: Thor is easily planetary level in energy projection. Hulk's only energy projection is probably his gamma radiation from above. Intelligence: Current Hulk is now definitely smart. He has battle stratergies and knows how to battle now due ever since the world war hulk arc. Thor however, has mellenias of experience, wisdom, battle smarts, and intelligence. However, he doesn't ever display it so it's argueble but it's due to Thor's immense magic and hammer. But imagine if Thor used said statements in his battles, possibly much more lethal than Hulk himself. Personality: With intelligence comes arrogance. And so it did for Hulk when he foolishly went into Olympus and called Zeus out and attempted to battle him. Hulk's new intelligence also brings him new personalities such as cockiness and arrogance. However, Thor also possesses these traits. In fact, it's also these traits that lead Thor to lose in battles he shouldn't have lost in. However, Hulk's arrogance almost lead him to his death against a much more powerful foe whereas Thor's lead him to lose against much weaker ones. So it's basically kind of leaning towards Hulk a bit in this area. I believe Thor should easily manhandlle Hulk under vine rules but this is completely my opinion. A character like Hulk simply cannot fight someone like Thor. This is way out of his league. "But Hulk has beaten Thor before!" And Thor has also vice versa. And I explained that Thor holds back. Now think, do you honestly think Hulk will survive against someone who can easily outspeed him by lightspeeds, out muscle him in the beginning, and kill him within several unrestrained magical weather attacks? The answer is no. 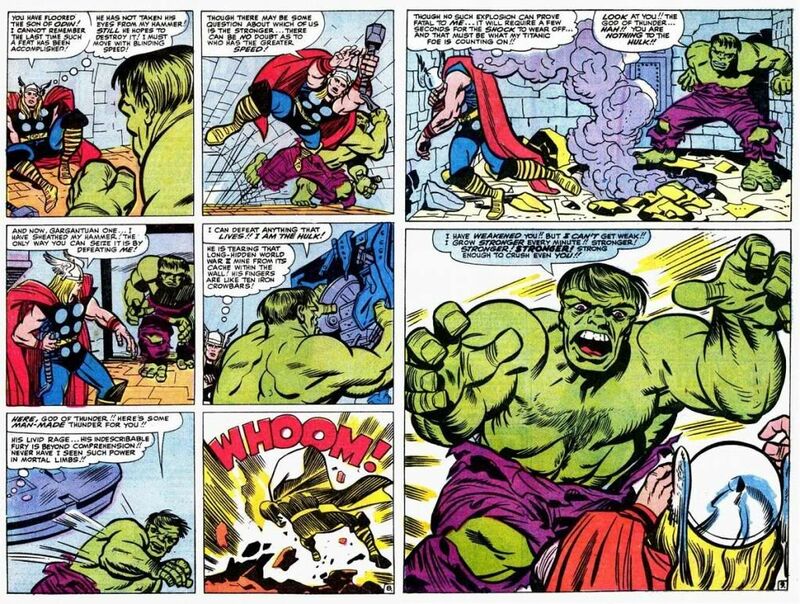 The only way Hulk can win against an unrestrained Thor is if he has pis on his side as well as comic story plot WHICH, he has none whatsoever here under Vine rules. I'm not being bias towards the Hulk. I just don't think he can logically win against Thor. 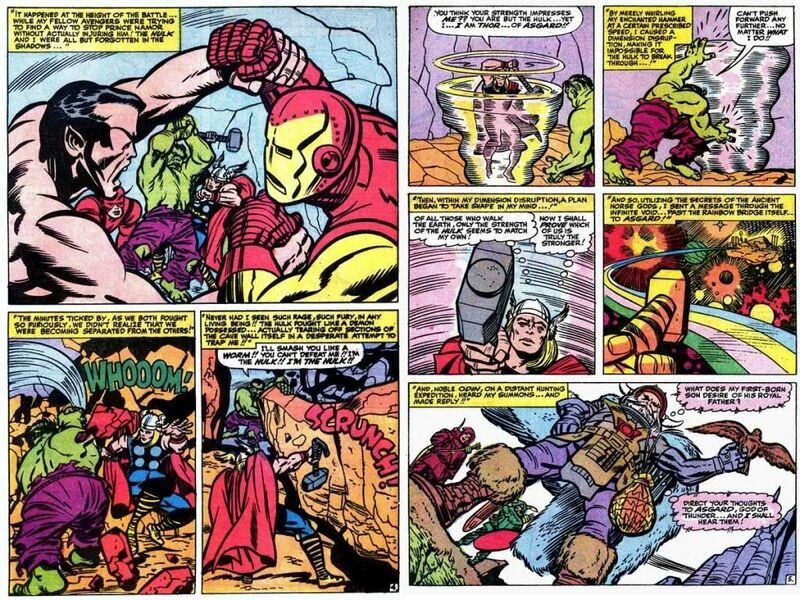 Hulk can also win this if Thor battles it out like a dumb brute since War Hulk has outsmarted Juggernaut. Because that's what Thor mostly does to Hulk. He constantly tests his strength against him due to pride, arrogance, and plot. I like the Hulk, but Thor, in my opinion, just outclasses him on almost every level. If your still unsure who wins, imagine yourself as both characters. Would you be the guy that can destroy the east coast with your steps, or would you be the guy who can fly at multiple lightspeed, control weather capable of destroy planet(s), and project energy? I personally would choose Thor. If not having the physical attributes of him is enough, having a magic hammer that can do alot of things is even better. I believe in my heart of hearts that Thor could beat hulk. I don't believe he could do it with just brute force. 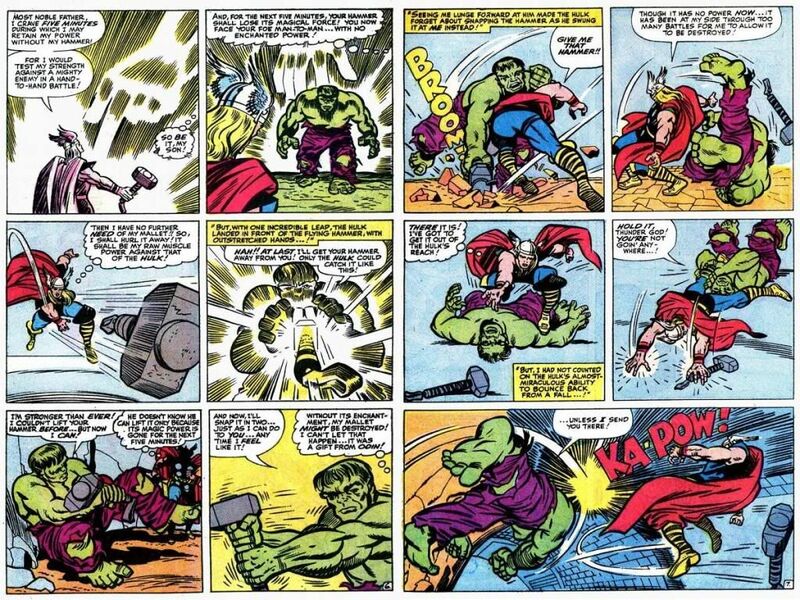 Thor has many other powers and skill sets that he can use against the hulk. I don't believe that it will be easy for Thor because in marvel, he is one of if not the strongest characters, and that has to count for something. So while I am a hulk fan, I will say that Thor can beat the hulk. Always thought that Thor could beat Hulk, though someone here convinced me otherwise, but I'm swaying back to my original opinion. I assume it's a Hulk fan with a name liaison to Hulk. The way I understand Hulk's powers to be is this. The madder he gets, the stronger he gets & he gets stronger by gaining more muscle. If there is no limit to how much stronger he can get, then in theory, not only should he be the strongest, he should be the fastest (because more muscles mean faster) and it will make him more durable so he doesn't tire out. So how does anyone beat something like that without some kind of cosmic intervention or Loebforce? I don't see Thor with anything in his arsenal that can beat something that should be stronger, faster and more durable than him. You got your opinion, I've got mine. Thore all the way. I think hulks bad don't get me wrong,but I seriously don't see him beating a Thunder God. Hulk would get Fried. 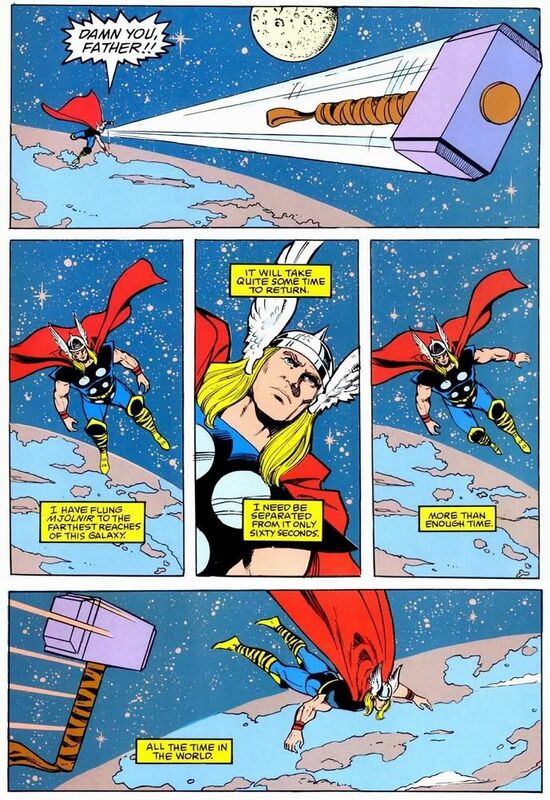 A guy at work told me that hulk lifted Thors Hammer a little,but struggled and only lifted it an inch off the ground. I would like to see the scans of that. Plus I think its Pis. No version of Hulk should be able to lift Thors hammer including Wold Breaker Hulk. What Keeps the Hulk indestructable is his dna. Not his anger. Yes the Hulks Fast,strong and very durable. any version of the hulk pretty much is. To get rid of the Hulk you would have to get rid of that dna I believe. Thor could do some damage being a thunder God. Might even be able to harm Hulk to where he turns into Bruce Banner. @NX: Well his strength increases depending on his emotions & he can regenerate limbs. I guess you can say it's in his DNA. From what i've seen from Thor, when he does perform these feats, he does have limitless strength and therefore he does get tired. The Hulk on the other hand can keep coming and wait until Thor passes out from overexertion. I guess what Thor can do is to destroy whatever planet Hulk is currently residing in and bide his time until Hulk can no longer breath. I could be wrong but I think Hulk can just hold his breath for an insane amount of time but he still needs to breath eventually. I don't know if Thor is willing to do that though. Also the fight with Zeus, i'm not saying Zeus can't beat Hulk, but in the story Hulk seemed like he went in wanting to lose. He wanted to sacrifice himself for his family. Yes the dna is what keeps the hulk indestructable. If you know alot about the hulk can he regenerate if his head got cut off? if so I wanna see scans. @Shamelesslysupportinaznballers: Yes the dna is what keeps the hulk indestructable. If you know alot about the hulk can he regenerate if his head got cut off? if so I wanna see scans. Sorry, no scans of Hulk being behead probably because it can't be done. I bet Majestic would be strong enough to rip hulks head off. Majestic is strong enough to move solar systems thats more than proof he can rip hulks head off. Let me give you a good example. in the first hulk movie the hulks dad injected that green stuff in him. thats how bruce became the hulk. same in the second film,that military guy cant remember his name had that doctor inject bruces blood in him and thats how he became the abomination. bruce was gonna get rid of it,but he got in angry mode before they had the time to drain it out. so they didnt get all of it. @NX: Ok, i'll give this one to you, Thor can beat movie Hulk. I'll also give you a win for Majestic, now let's get back to Thor vs 616 Hulk. How is Thor going to rip off Hulk's head, with a billion lighting bolts, a gazillion winds? Not with his bare hands because Hulk would rip off Thor's head before Thor can rip off his. Yeah thats true. it does all depend which version of the hulk. Alot of people think any version of the hulk including world breaker hulk would lose to thor. 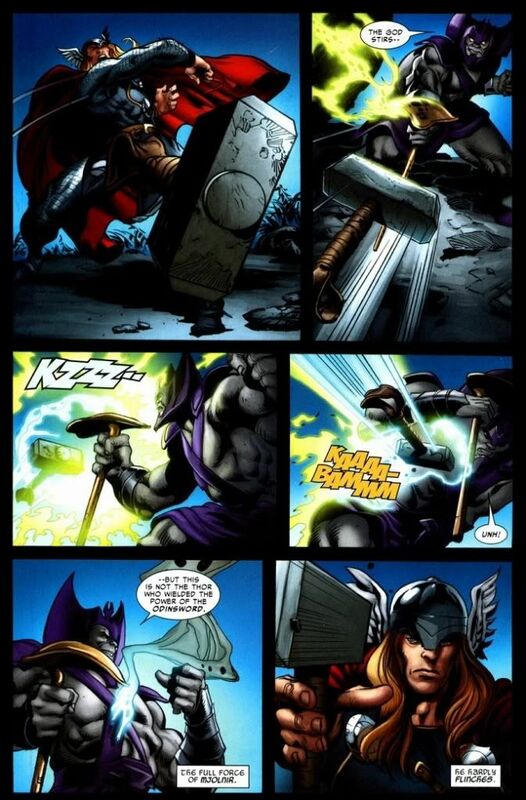 Really without Thors hammer he isnt really wouldnt be hard for hulk. when Thor has that hammer being a Thunder God. Hulk stands no chance. Also Hulk will die if he gets thrown into the sun. Thor can teleport him there. If you want to debate Hulk vs Thor, go to battle forums. This isn't a debating thread. Let me check your title again, oh you did call it "My blog on Thor vs Hulk, who should win?". Why post this on a forum and put a question mark on it then and then make it seem like you are posing a question to your reader. No offence,but I was thinking the same thing about this thread. Why didn't you put it on the battle forums. if the thread has anything to do with hulk vs thor of course people will debate. Well, to my observations, the poster who created this thread isn't actually making a battles thread, more of an editorial opinion piece detailing the history of both character's, comparisons, even including writers opinions and perspectives and so on. So its as much a rhetorical question as much as an actual question. As if us posters can respond to the blog looking at certain components and discussing them, rather than saying "who we think wins" so its about methodology and analytical abilities? *smile* Anyway thats what I assumed... answers both your questions and I didn't even have to ask the OP? Since if I did pose the question, I would have probably posed it first instead of giving my opinion? I get it. I'm off this thread. Using his sum total of physical, elemental, weapon and godly powers; Thor should clearly be the winner. And you're right my friend. It is rhetorical. i have to agree. The main argument i hear for Hulk is that the more Thor hit him the madder and stronger and more durable the hulk would become. But that doesnt change the fact that if thor hit him once as hard as he could with the hammer, there would be nothing left of the hulk. hulk would never get the chance to get stronger and stronger and stronger...blah blah. 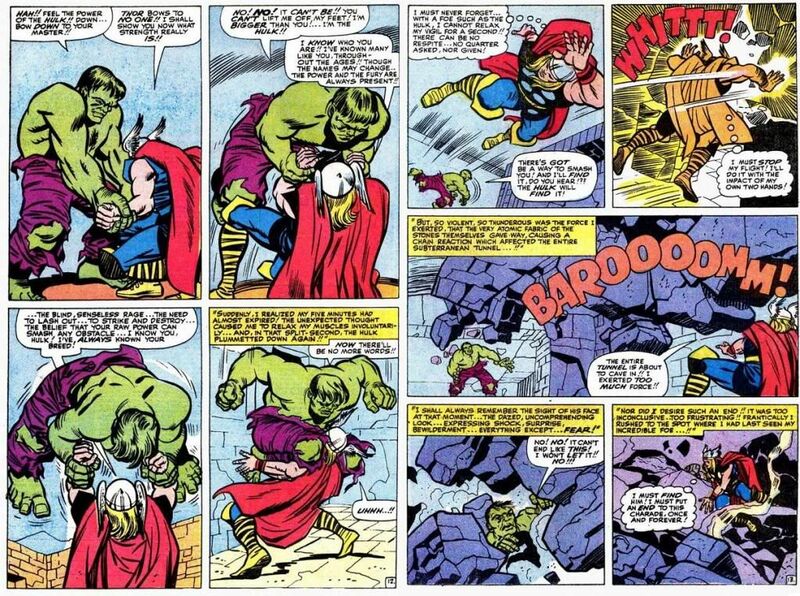 thor has an arsenal of ways to put hulk down for the count in about half a second (if he takes his time). they just are not on the same level. u make jokes about the Hulks mom for about 15 hours and hit him with a cattle prod a few times then maybe he will be mad enough to slow thor down, but thats about it... just a slightly longer fight with an inevitable victory for Thor. Of course on this forum everybody will pick Thor. But in the other forums it will be the Hulk. My opinion is Thor should be able to take this guy. It will be a tough one. The problem is the Hulk's so called madder-stronger bull*^%#. That has given him a plot protection from a a## whipping. He should have a weakness or flaw. Some extreme fanboys think the Hulk could survive Galactus and the upper echelon. To be honest, Hulk's power levels are so varied that I have no idea. Thor would because Hulk's small legs can't jump. Thor everyday. And twice on Sunday. Outstanding post by pumpmastaflex!! Very well thought out, logical examination of how a throw down between these two powerhouses should go. 1) Marvel has milked the confrontation between these two goliaths for decades. One of the major reasons Marvel has not outrightly declared Thor as the strongest superhero at Marvel is because any future conflicts from said moment of declaration would water down any future conflicts they had. 2) Love'em or hate'em (I happen to LOVE Stan Lee), Stan Lee, collaborating with Jack Kirby, John Buscema, Steve Ditko, Herb Trimpe, etc...engineered his characters with "suspension of disbelief"...he wanted to make what the characters did seem somehow believable. That's what I grew up with, so for me personally, the Joe Quesada era ushering in the "it's comics, anything goes!" philosophy is problematic. His philosophy is diametrically opposed to Stan Lee's. I'm sorry, you can't just blow off 40 or 50 years of continuity just to give free rein to "artistic license" or whatever weird mantra Marvel now operates by. Kind screws the stories and character up and alienates fans in the process. 3) I don't know that Stan would ever come out and outright declare it, but it was clear to me from reading his book Origins of Marvel Comics that Stan seemed to always have DC's Superman in mind when he was creating some of his characters. Thor, in my opinion, was Stan's first direct attempt to compete with, and ONE UP, the Man of Steel. Thor was designed to be Marvel's strongest, most powerful, wisest and most innately good (noble) character in the Marvel universe. With Kurt Busiek being a loud voice at Marvel now, we will NEVER see that. Ever. The guy hates the character. Furthermore, he LOVES Superman. Yeah. Pretty sad. I think Stan would say they are fairly even in raw brute strength, but ONLY when Hulk is RAGING PISSED OFF. As many by know, Thor is a far more skilled combatant, as you mentioned he has stated numerous times that he holds back against mortals (particularly against Bruce Banner an innocent man whose life has been cursed by his alterego). Now add inherent powers over the weather/elements and Mjolnir, Hulk really has no chance. 4) Hulk's anger being the controlling factor in his strength is problematic. Why? You can only get so pissed off. Everyone has a ceiling. His strength is based not on how long he is pissed off but how pissed off he actually is. The idea of limitless strength being what gives Hulk his strength is, therefore a fallacy. Besides, there are a few other Marvel characters who are in the same "limitless strength" category. The term limitless is really subjective. Trust me, I can't see an enraged Hulk going toe to toe with, say, Tyrant, for example. Tyrant would mop the floor with Hulk, no matter how angry the Hulk was. Don't get me wrong, Hulk is the poster boy for superhuman strength at Marvel, but in my opinion, Hulk at the height of his strength, is about equal to Thor. 5) Each character's feats in the comics are conveyed by different writers with different perspectives on what they think is strong. 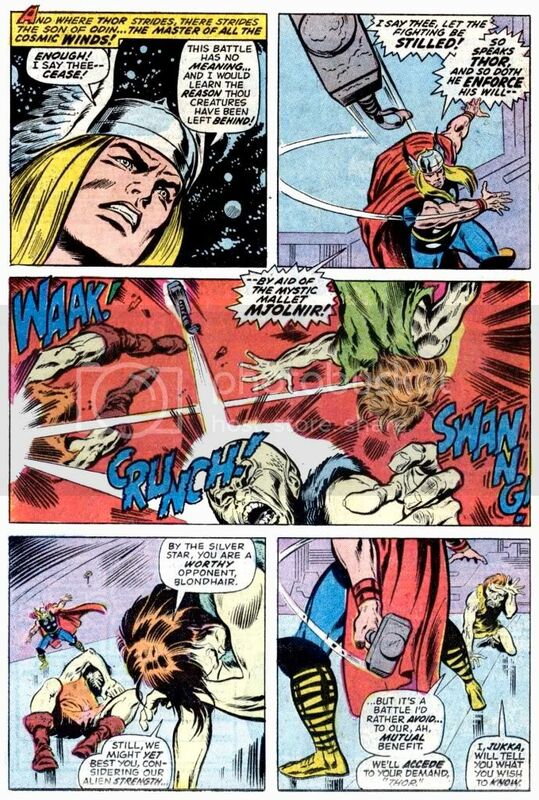 A few years ago, Thor is seen lifting Asgard over his head with the aid of Beta Ray Bill during the Skrull Invasion. Evidently, that was supposed to be impressive. Thor has ripped through admantium cables with his bare hands and lifted the Midgard Serpent overhead. This guy struck a celestial so hard, not only did he knock a huge hole in the celestial's armor, the resulting shock wave shattered mountains for miles around. A quick side point: I have seen Thor's skin cut, or pierced, by an axe and otherwise seen other writers demonstrating he could bleed. When you consider Thor has, in decades past, demonstrated his nigh invulnerability by holding nuclear warheads in his bare hands while they exploded or taken a blast from "the doomsday bomb", designed to destroy a galaxy, with no ill effect and then survive an orbital fall to nearby planet Patagonia...I just don't see his skin being pierced by conventional means. So, Thor's real problem is, he can't get no love at Marvel. And you would think Marvel would be capitalizing on his popularity right now...his movie was fairly successful. In my opinion, Marvel chased off the best writer for Thor Marvel and fans alike have seen in decades in JM Stracynski...now that guy portrayed Thor the way he should have been portrayed. Fraction, should not be writing Thor. He's a good writer, but Thor is not his realm. @PunkMastaFlex: This was awesome, thanks. "Thor is physically the strongest of the Norse gods and one of the most powerful beings in the Universe. His feats include easily lifting a million tons, crumbling uru metal(what his hammer is comprised of) into dust with his bare hands, shattering the force field of the Silver Surfer with a single strike, knocking out Namor while in the rain, bringing the Juggernaut to his knees with two blows, beating Hercules in a arm wrestling match, stalemating Savage Hulk's strength for an entire hour(even though Hulk was getting stronger and stronger and still unable to overpower Thor) defeating the Gladiator in 60 seconds with nothing but his fists, lifting the Midgard Serpent, who was so large it could coil itself around Earth several times over and crush it in within its grip, overpowering cosmic entities when pressed in battle and physically destroying stars and planets with his own strength alone. Thor is also capable of entering into a state of Berserker Rage known as Warrior's Madness, which will temporarily increase his strength tenfold but will only do so in desperate situations because it threatens his sanity." Have you ever heard of Rune King Thor?... Of Odin Force? (ooooh World Breaker Hulk smashes planets by walking... impressive... Do ya now that Odin creates Stars while walking?)... Of Thor owning in a couple of seconds the Red hulk which had owned the green one? Did you now that Thor died for his own people sake sacrificing himself by destroing the DESTINY itself and killing a bunch of Abstract/elder-god level people?... When the Hulk will be able to destroy galaxies let's talk again... If not... Thor, Odin Force and Rune power rules. P.S. The green scar beats Void nearly to stale since he becomes Banner Hulk (Banner with green eyes). Thor litterally annihilate voids with 1 single strike. An informative and interesting blog post which I thoroughly agree with. Thor should easily be able to beat Hulk. He has far greater versatility when it comes to powers and abilities. He's faster, able to use more powerful ranged attacks and has far more combat experience than the Hulk. He's considered at Superman level in the MU and pretty much most fights between Superman and the Hulk on the battle forums have pointed to a Superman victory. However, it is the writers who hold both Thor and Hulk back as if one defeated the other in a straight up battle, then there would be outrage from the Thor/Hulk fans depending on who lost. Having said that though, I really want to see a fight where Thor dominates the Hulk as Thor is by far more powerful in overall terms than the Hulk and deserves to win. In terms of strength they are matched but Thor has many other areas where he is superior to Hulk. Obviously Thor. Tbh, they've been disrespecting thor's god status big time. Look up a thread called "Perception of the Gods." I think it would be 50/50 equal power. Hulk took Sentrys power of suns so the wind thing isnt that much compared to that. Hulk has a healing factor his blood gives life he had his neck broken and people said he shouldnt be able to move again but he got up like nothing. Scorpion girl stung him with poison and special metal to turn his healing against him and it just mad him madder. In my opnion i dont think Hulk really wanted to fight Zues he wanted help and thought if he sacrificed himself for the other Hulks they would heal red she hulk and the others. Thors nothing to play with either but all around there powers to me seem about 50/50 even though Hulks arent as flashy. In my opnion I think the reason they both beat each other all the time is it depends who wanted to give up first other wise they would fight for a long time. in terms of their fighting in the comics, both have won and lost. but thor has a way more impressive win when he actually killed the hulk. with one arm. and without mjolnir. and while fighting the thing at the same time.